Tomato history is an interesting one. Historians believe the origin of tomatoes can be traced to the coastal highlands of Central and South America where they grow wild in the countries of Ecuador and Peru. They were cultivated in ancient Mexico. The name tomato comes from the word 'tomatl' in Nahuan, the language of the Aztecs of Central America (Aztecan). Interestingly the word 'chocolate' has Nahuan origins as well. Spanish explorers are credited with introducing the tomato to Europe in the 1500s, where it was called pomodoro, Spanish for "golden apple". 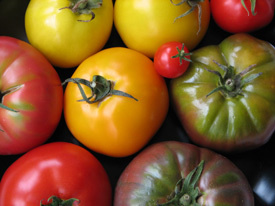 This suggests that the first tomatoes brought to Europe were yellow. The earliest recorded mention by a European was by Venetian Pietro Andrea Mattioli, a doctor and naturalist who in the year 1544 recommended seasoning with salt, pepper and oil. The addition of tomatoes to the Italian cuisine in the 18th century gave us the current form of the pizza. In the northern part of Europe, however, the history of tomatoes tells of a plant that was grown in greenhouses as an ornamental, one that was unhealthy at best and possibly poisonous. An English newspaper published a story in 1864 claiming research showed the tomato was not only edible, but had health benefits. A short time later some growers were already producing tomatoes for consumption and export. By the 1880s greenhouses built specifically for raising tomatoes were already dotting the countryside around Guernsey, which used to be famous for its tomato exports. Tomato history includes an episode dramatized in a 1940s CBS radio broadcast. Colonel Robert Gibbon Johnson of Salem County, New Jersey, had first introduced the tomato to the United States from abroad in 1808. After offering an annual prize for the largest tomato, he promised a public demonstration to prove that the tomato was safe to eat and not merely ornamental. In 1820 on the steps of the Salem courthouse a crowd of cheering spectators gathered to watch the poor fellow die from consumption of the poisonous fruit. Colonel Johnson bravely told the crowd he would eat an entire basketful and survive. To the possible chagrin of the eager crowd the colonel consumed an entire basket of tomatoes without keeling over or suffering any ill effects whatsoever. Whether the tale is true or not, we do know that the tomato began to become a staple of the American kitchen. The third president of the United States, Thomas Jefferson, recorded planting tomatoes in all the years he carefully wrote in his "Garden Kalendar" (1809-1824). Tomatoes commonly appear in the Jefferson family recipe collections. Two of his favorite varieties were the "dwarf" and the "Spanish". Today if you visit his homestead at Monticello, Virginia, tours of the vegetable gardens are available, and a tomato tasting contest is conducted each year. Recent top finishers include the Sun Gold, Black Cherry and Rose. The tomato is the most popular garden vegetable today. This could be because they are easy to grow in the family garden, and just a few plants provide an adequate harvest. The flavor of the homegrown tomato surpasses any you can buy at the local market or grocery store.